Luxor: The world's greatest open-air museum The age-old city of Thebes, now Luxor, is bisected by the Nile river. The East Bank represented Life to the Ancient Egyptians, and the West Bank, in the direction of the setting sun, symbolized Death. There the pharaohs erected the royal tombs – 63 in total – that still stand today in the Valley of the Kings. The legendary burial place of Tutankhamen was discovered here in 1922. At the vast Karnak Temple Complex, the Precinct of Amun-Ra houses the 5000 m2 Hypostyle Hall and its forest of 134 giant columns decorated with stunning friezes. The Sacred Lake, ram statues, obelisks and pylons dazzle visitors as they trek back through millennia of Egyptian history. Follow the Avenue of the Sphinxes from Karnak to Luxor Temple to gaze upon its colossal statue of Rameses II, towering red granite obelisk and imposing colonnades. In the evening, sound and light shows illuminate the ruins and resonate with tales of pharaonic achievements. To get up close to Luxor's archaeological treasures, explore the Temples of Medinat Habu and Hatshepsut, the Valley of the Artisans and the Luxor museum. 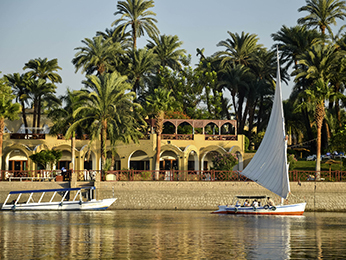 Alternatively, soar above the Nile valley in a hot air balloon.